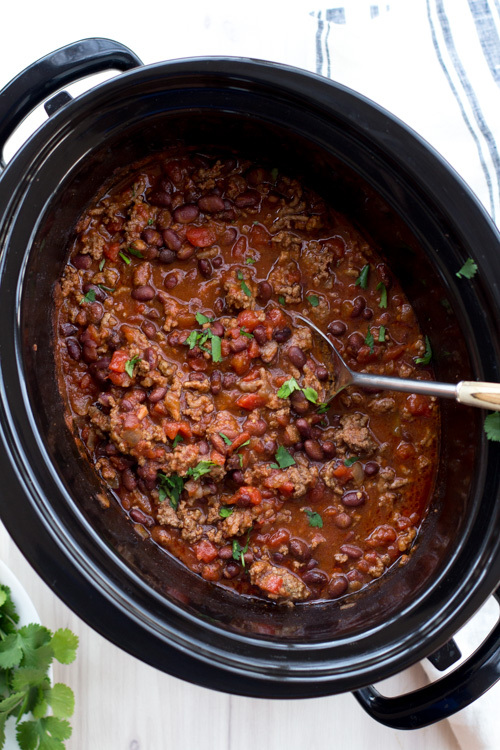 I know you’re going to love this recipe for slow cooker beef, lime, and cilantro chili. It’s absolutely delicious and so easy to make. Is there such a thing as too many chili recipes? I think not. 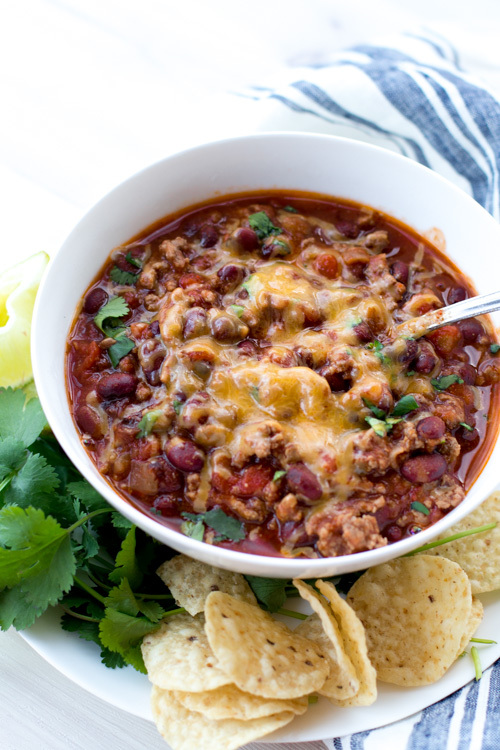 We’re obsessed with this turkey and black bean chili and this Mexican chili with cornbread topping, and the millions of others in my freezer meal eCookbooks. 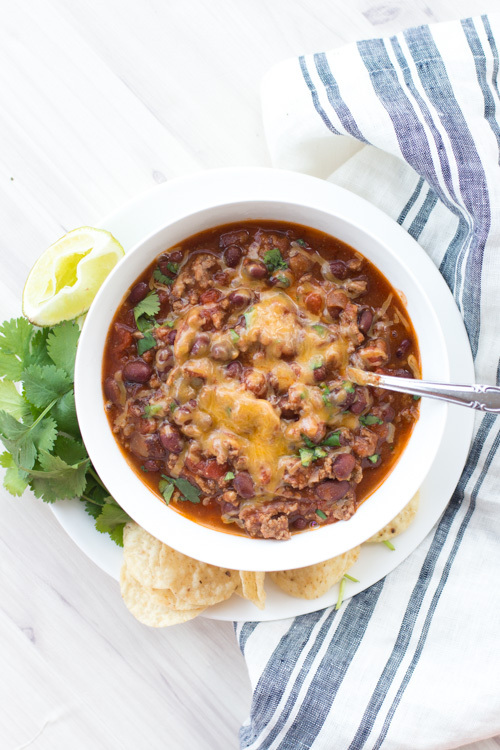 I think it’s safe to say that chili is one of my favorite recipes to make in my slow cooker. 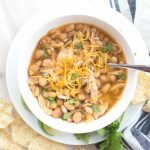 Not only do my kids love it, but it only takes a few minutes to add everything to the slow cooker and call it a day. If you’re looking for extra gold stars, you can add all of the ingredients to a gallon-sized baggie and freeze for later. 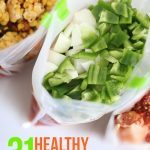 It makes meal prep extra fast in the morning, and I love always having an extra meal on hand for busy weeknights. You can even quickly thaw this meal in a pinch and boil it in a big pot on the stovetop. I’m all about the options, friends. I think what you’re going to love most about this recipe is the addition of lime and cilantro. The lime flavor is subtle, but it adds something special to the recipe and it tenderizes the beef to the point that it melts in your mouth. YUM. 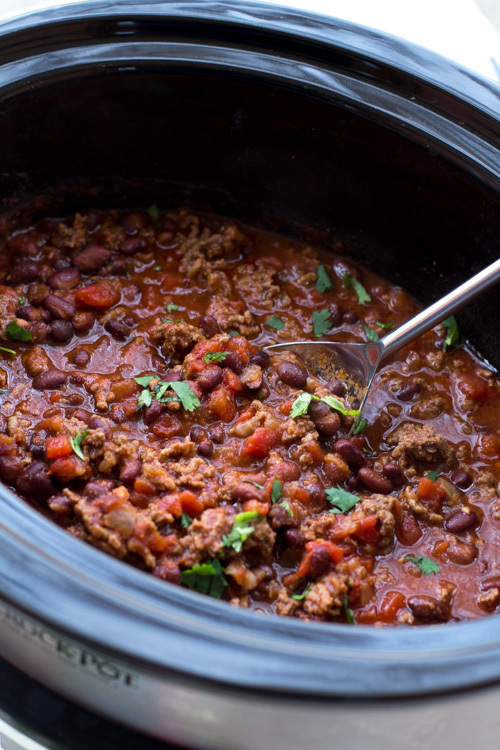 Add all of the ingredients to your slow cooker (except cilantro) and cook on low for 8 hours. Break apart beef and stir in about one tablespoon of fresh cilantro. Spoon into bowls and top with shredded cheddar cheese and tortilla chips. So good! 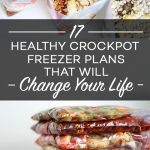 Kelly, My husband and I are excited to try out some of your freezer recipes! I have a question about the crock pot. We have a 6 qt crock pot. How would you recommend modifying your recipes so we can cook them successfully in the slightly larger size? Thanks! I think they will work just fine. I have a 4-qt crockpot and a 7-qt one, and I don’t think your 6-qt will cause a problem. Just watch the cooking time. My 7-qt cooks faster than my 4-qt and your 6-qt might be the same. If that’s the case, I would take an hour or two off the recommended cooking time. I made this, but used chicken instead of beef. It was still delicious. Thanks! Great idea! I’m going to try it myself. Thanks so much for sharing. If you were going to use chicken would you use ground chicken or shredded breast? Thanks! I’d use breasts and shred them after cooking. if freezing do I cook the beef before freezing? In that case, do I need to cook the beef just before adding it to the Slow Cooker? Or do I throw everything raw in the Slow Cooker? I would just add it raw. Can I add it to the slow cooker frozen or do I have to thaw first? USDA Food Safety and Inspection Service recommends thawing raw meat before placing it in a crockpot. Mine isn’t always 100% thawed, but I think it’s OK if the meal is thawed enough to be broken apart. What brand of canned tomatoes/tomato sauce do you like to use? I usually buy the cheapest organic ones that I can find at the grocery store. The brand doesn’t matter to me. I’ve bought them at ALDI, Costco, and our local grocery store. I’ve soaked and cooked dried beans and frozen them (and added them to freezer meals), but I’ve never added them to freezer meals right after soaking. I think it would work, but I’m not sure how much extra liquid would be needed. Sorry about that. For what it’s worth, I tried dried beans with your Turkey Black bean chili. After 9 hours (turkey was still a little frozen at the start) about half the dried-presoaked beans were cooked and half had a firm texture to them. My family didn’t mind (and the chili was awesome). So it seems dried beans may just require a longer cooking time. I didn’t change anything else. 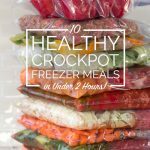 Thanks for all these great crockpot recipes! Perfect. Thanks so much for sharing, Jenny. That’s very helpful information.